George Mathew Fernandes was one of the firebrand Socialist leaders of his time. A priest for a short period, a trade unionist, agriculturist, political activist, human rights activist, parliamentarian and journalist all rolled into one. He led the famous railway strike involving 1.5 million workers in 1974, where the entire nation was brought to a halt. 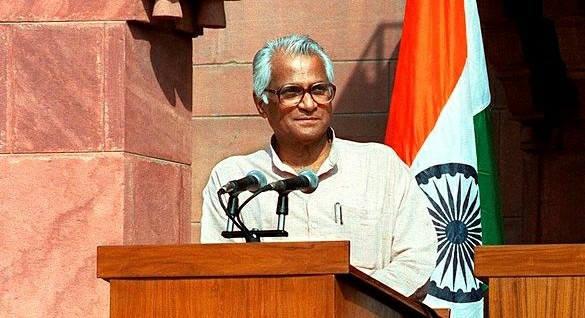 As the former Chairman of the Socialist Party of India, former Minister of Communications, former Minister of Industry, Minister of Railways and Minister for Defence, George Fernandes was full of surprises and contradictions. I clearly remember when he was a union minister of the Morarji government, he defended the no-confidence motion against his government for two and a half hours and then resigned the same day. That was George! A politician who long campaigned against the atom bomb was also one of the champions of India India’s nuclear power. Fernandes set new standards as a Defence Minister by braving the inhospitable Himalayan heights to visit troops on the battlefront and became the darling of the jawans. In1949, Fernandes moved to Bombay in search of a job. His life was tough in the metropolis, and he had to sleep on the streets until he got a job as a proofreader for a newspaper. He relates to the beginning of his career by saying, “When I came to Bombay, I used to sleep on the benches of the Chowpatty Sands. In the middle of the night, policemen would come and wake me up and ask me to move”. Here he came in contact with the great Socialist leader, Dr Ram Manohar Lohia, who was also one of the greatest influence on his life. Later, he joined the socialist trade union movement under the veteran trade union leader Placid D’ Mello and became his disciple. He rose to prominence as a trade unionist and fought for the rights of labourers in small-scale industries such as hotels and restaurants. Emerging as a key figure in the Bombay labour movement in the early 1950s, Fernandes was a central figure in the unionisation of sections of Bombay labour. As a fiery trade union leader, Fernandes organised many strikes and bandhs in Bombay in the 50s and 60s and soon came to be known as “Bumbai Bandh Ka Hero”. He served as a member of the Bombay Municipal Corporation from 1961 to 1967 and continuously raised the problems of the exploited workers in the representative body of the city. The pivotal moment that thrust Fernandes into the limelight was his decision to contest the 1967 general elections. He was offered a party ticket for the Bombay South constituency by the Samyukta Socialist Party (SSP) against the politically more popular Sadashiv Kanoji Patil of the Indian National Congress in Bombay. Sadashiv Kanoji Patil, or S. K. Patil, as he was popularly known, was a seasoned politician, with many decades of experience behind him. SK Patil was also a powerful minister in the Indira Gandhi cabinet and an unrivalled fund-raiser for the undivided Congress party. Nevertheless, Fernandes won against Patil by garnering 48.5 per cent of the votes, thus earning his nickname, “George, the Giant Killer”. In the early 70s, Prime Minister, Indira Gandhi was riding the crest of unprecedented popularity after the liberation of Bangladesh. But soon after, with notorious corruption cases against her, primarily because of the public awareness created by movements like Navnirman in Gujarat and Bihar, her popularity started waning. George organised one of the most notable agitation- the railway strike of 1974, at that time when he was President of the All India Railwaymen’s Federation. This was also the time when Indira ordered the well-known Pokharan nuclear explosion in the deserts of Rajasthan. There are political analysts who believe till today that the much controversial step was taken by her out of sheer despair, and with the sole intention of breaking the railway strike. The idea was to divert the nation’s attention and drum up support for herself. (It is a historical irony that while Pokharan I was prompted by George’s strike, Pokharan II was executed with him as the defence minister in the Vajpayee government). But George Fernandes will also be remembered as the one who justified the Gujarat riots in 2002 and murder of Australian missionary Graham Staines and his sons in Odisha. Once upon a time, he was a proponent of Mahatma Gandhi’s politics of non-violence but then turned to believe in politics of violence and organised the ‘Baroda Dynamite conspiracy’- a plan to blow up government establishments to protest against the Emergency. When Emergency was lifted in 1977, Madhu Limaye was offered ministership in Morarji Desai’s cabinet but he insisted to make George a minister to end his trial in the ‘Baroda Dynamite Case’ so that George could come out of jail. Fernandes has a stained and murky past and will also be remembered for making this country a “Friend of Israel” by using spies like Ram Swarup as an agent of Israel and against Palestine. His was a life riddled with controversies and accomplishments alike. A towering figure in modern Indian politics, George was compelled to leave the public eye at the fag end of his political career when his name figured prominently in a corruption case. The scandal caused an uproar and Fernandes had to resign from this role as a Defence Minister in the Vajpayee government. Any chances of returning to political life were quashed with the onset of Alzheimer’s and Parkinson’s disease. George passed away at 88 and lived with his once-estranged wife Leila Kabir. Rest in Peace George. Uniform Civil Code : The debate is not just related to Muslims only!